Canadian residents in a Quebec village are pleading for help to save group of killer whales trapped under thick arctic sea ice and left with only one small hole for oxygen. Residents in the remote village of Inukjuak have been watching helplessly as at least 12 whales, also known as orcas, struggle to breathe out of a hole slightly bigger than a pickup truck in a desperate bid to breathe. 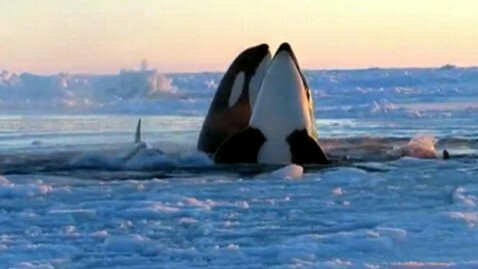 The community has asked the Canadian government for help in freeing the killer whales, believed to be an entire family. The government denied a request to bring icebreakers Wednesday, saying they were too far away to help. Inukjuak, about 900 miles north of Montreal, is ill-equipped to jump into action. Residents have turned to the Internet and posted the video of the killer whales, hoping someone could help free the trapped orcas. The video shows some whales calmly taking turns, while other whales jump several feet out of the water through the air for oxygen. They hold their breath under water and breathe above water through blowholes on the top of their heads. "I don't know how far it is to the next air hole, but I don't imagine they do either," Joe Gaydos, a director and chief scientist at the SeaDoc Society in Eastsound, Wash., told ABC News. "That's why they are coming up and looking with that spy-hopping behavior that they're showing." The growing international chorus has reached all the way to Wisconsin's Greg Ferrian, who has experience in these kinds of situations. Last year's movie "Big Miracle," starring Drew Barrymore, was inspired by Ferrian and others who used special ice-fishing equipment to help rescue three whales trapped in Alaska in 1988. "We just saw [the video] and figured we know what they need. We've been through it before," Ferrian told ABC News affiliate KSTP-TV in Minnesota. The whales are in a race against time because the hole they're using to breathe through is rapidly closing as temperatures continue to drop, the U.S. Coast Guard said. A hunter first spotted the pod of trapped whales Tuesday. It is believed the whales swam into the waters north of Quebec during recent warm weather. Temperatures suddenly dropped, freezing the water in Hudson Bay.